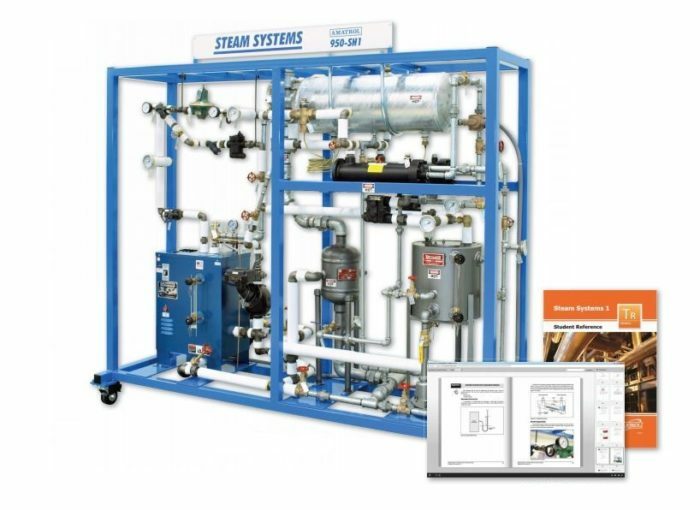 Amatrol’s Steam Learning System (950-SH1) introduces learners to the operation, installation, maintenance, and repair of steam systems and their application in paper mills, commercial and residential settings, power companies, and even nuclear submarines. Amatrol’s exceptionally thorough curriculum covers a comprehensive range of steam system topics, including both practical applications such as how to operate a boiler and theoretical knowledge like the coefficient of volume and thermal expansion. The 950-SH1 includes an electric boiler, blowdown separator, condensate feedwater system, heat exchanger, strainer, and steam trap. This learning system also comes with a welded steel mobile workstation (32-in W x 82-in H x 92- in L) with 4” square welded steel tubing and heavy duty casters. Amatrol supplies these industrial-grade, top-flight components in order to give the learner an opportunity to work with real-world mechanisms and gain experience they would normally only acquire on the job. Amatrol’s world-class curriculum infuses the scientific theory of steam and how it’s harnessed for practical applications so learners can practice on the 950-SH1 Steam Learning System. The 950-SH1 explains important concepts like internal energy, specific heat capacity, and flash steam, as well as important calculation for steam power, such as calculating the change in enthalpy caused by phase change. Learners can then see how this theoretical material applies to tasks like the startup, shutdown, and blowdown of a boiler; the operation of an OS&Y valve; and how to test a steam trap. Amatrol’s 950-SH1 also provides learners with a thorough understanding of the dangers of working with steam systems and the safety precautions that can prevent injury. The 950-SH1’s curriculum teaches ten basic safety rules for working around steam systems, such as the appropriate choice in clothing to avoid burns, what safety components are present on a steam system, and the dangers of opening and closing valves without knowing their function. The 950-SH1 also covers maximum allowable working pressure (MAWP) and how safety relief gauges can keep a user safe when pressure builds in a steam system. The 950-SH1 Steam Learning System features an electric boiler that is an ASME-coded pressure vessel rated at 100 psig that can attain 36 psig steam pressure and 36 lbs./hr flow rate. The boiler also features low water cutoff/level control, steam pressure gauge, and both automatic and manual reset operating controls. The 950-SH1’s condensate feedwater system features a 9 gallon condensate tank, turbine type condensate pump, and a 0.5 Hp electric motor. The steam learning system also features several valves, including: pressure regulator, safety relief, temperature regulator, 2-way, check, and globe.